Christmas cooking is over for another year. I realise it is a stressful experience for some people, but I had a great time being able to cook for visiting family. We had a roast goose (turned out very well for a first time experience), plum sauce (I have blogged this recipe before), potatoes roasted in goose fat and assorted other roast veggies. It was all very delicious, but the stand out was a surprising number. It was cauliflower cous cous (named for the cauliflower pretending to be a wheat based thing), from Recipe Community. Its another Matt Stone recipe, like the almond milk rice pudding, so no wonder it worked so well. I chose it because of the Christmassy colours, but really had no idea how it would taste. Cauliflower is the tofu of the paleo circuit. It is used to stand in for other grains, such as rice or cous cous dishes. It also features in a lot of raw recipes. Thermomix makes the required transitioning of large vegetable into tiny grains very easy. You chop the stalky bits on 6 for a 10 seconds, checking they are evenly chopped (if not, another few seconds after scraping down the sides) then put in the florets on reverse, Speed 5 for 2-3 seconds. You don’t want to make a puree, but rice sized pieces, so keep an eye on it while chopping. Once you have a big bowl full of cauliflower ‘grains’ put them into a large salad bowl and get to work on the rest. No need to rinse the bowl in between all these steps. It all ends up in the same salad. Shell a bowl full of pistachios. You want to end up with around 100-150g of shelled nuts. Put them in the Thermomix bowl and chop 2-3 seconds Speed 5. Add to cauliflower in salad bowl. Tear up a big handful of parsley and another of coriander. Throw into Thermomix bowl and chop 2 seconds on Speed 6. If you don’t have coriander just double the parsley. Thats what I did. Add to salad bowl. 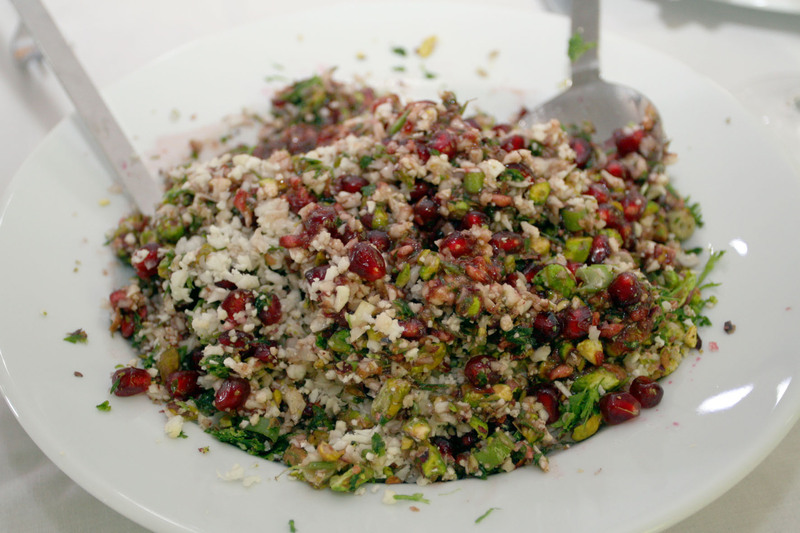 Sprinkle pomegranate seeds over the salad. I used almost a whole pomegranate’s worth of seeds, but its up to you and your relationship with pomegranates. I love the sharp and sweet taste with a little crunch. There is a YouTube video of how to deseed a pomegranate in a Thermomix if you are interested, along with quite a number of handy Thermomix how to videos. I just did it by hand with a few splatters to add to the Christmas outfit. The dressing calls for pomegranate molasses, which you can of course make in a Thermomix, but I didn’t have any on me on the day, so I mixed a few splashes of balsamic vinegar, 80g olive oil, the juice of two lemons, 1/2 teaspoon ground cinnamon and a liberal grinding of pepper and a sprinkling of salt. I was mixing it in the Thermomix, so thought why not throw in a handful of pomegranate seeds that I was about to add to the salad. Mix it all up, Speed 6 for 10 seconds and you have a tangy dressing with a little sweetness that just melds the whole thing together. Drizzle on dressing and toss salad thoroughly so all components are nicely mixed. You will have people asking for the recipe. Christmas present making is underway and I am determined to actually make all teacher, neighbour, postman, market providore gifts this year. The postman has been delivering a few more Thermomixes to my door in the last couple of months and he deserves something for having to put up with me answering the door in pjs and bed hair. The apple man at Kelvin Grove Markets regularly gives me a bag of slightly scarred fruit for free, so it is only fair he gets a jar of that produce back in return. I have posted a winter fruit jam – perfectly timed for school fetes – with Pear and Ginger Jam. Now for your summer fruit jam recipe. Peaches are a great fruit to jam with because they are often found squishy in your fruit bowl or at least a few battered ones at the bottom of the bag when you get home from the store/market. Nothing better to do with squishy fruit than turn it into jam. This jam also makes your house smell wonderful while cooking it. And if you steam the fruit first as per instructions below to make removing the skin easy you end up with a rosy coloured water that is perfect for making Turkish delight without having to use food colouring. See further posts once I perfect my jelly setting techniques for this one. Take a kilo of peaches. Any kind you like. If you have a lovely fruit providore relieve them of peaches that have scars or are slightly bruised and won’t sell. You are likely to get these either free or much cheaper than your perfectly formed, photogenic fruit. Cut a cross in the bottom of each peach and fit into the steamer basket and Varoma. Pour water to 1Litre mark (halfway up) in Thermomix bowl. Insert steamer basket, lid and put Varoma in place. Select Varoma heat, 20 minutes, speed 2. Check peaches to see if skins can be easily peeled off. If peaches still too firm cook for a further 5-10 minutes. 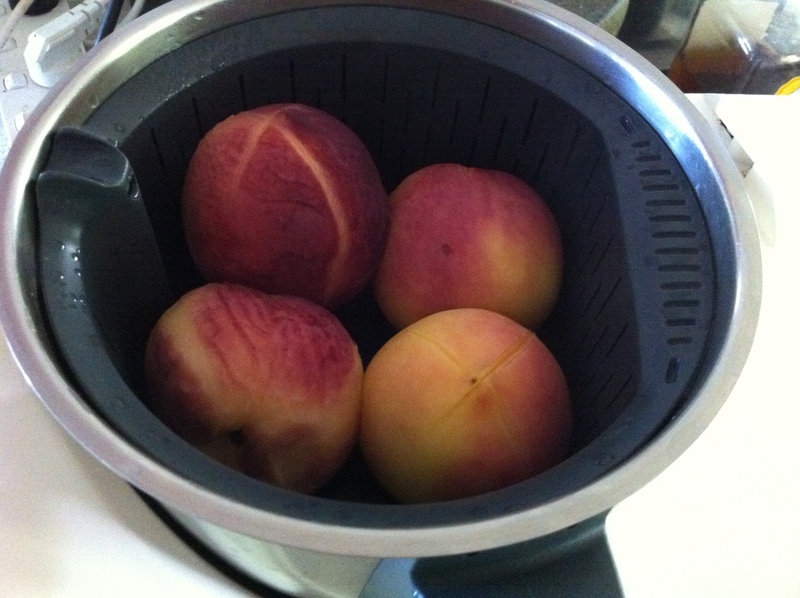 Allow the peaches to cool a little so you can peel them without burning your fingertips. Pour out the water from the bowl – keeping it if you plan to make jelly with the peach hued liquid. Peel peaches and remove the stones. Set peach flesh aside. Peel the zest from two limes. Quarter a granny smith apple, leaving core in. Place zest and apple in Thermomix and blitz for 10 seconds on Speed 9. Scrape down sides and check if its all chopped finely enough. If not, blitz again. Press scales button and weigh in peach flesh. Juice zested limes and add juice to Thermomix bowl. Match the total weight of peaches and juice with raw sugar. 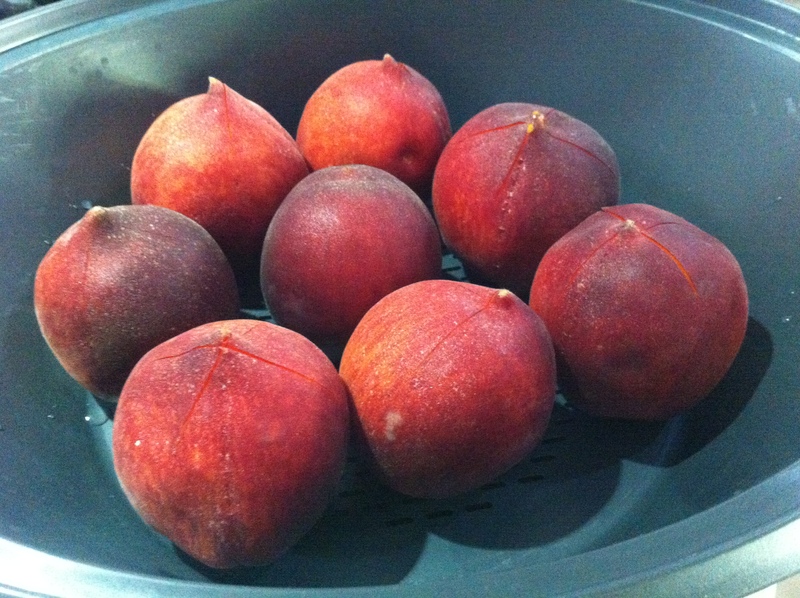 I ended up with around 600g peach flesh and lime juice and so added 600g raw sugar to the bowl. Put the lid on and select Varoma heat, 25 minutes, speed 2. Put as many jars as can fit in Varoma and put on top. This way you can sterilise and heat your jars while you make your jam. Put a saucer in the fridge so you can test the setting of your jam. Cooking time will depend on how much water is in the fruit, which varies from fruit to fruit. Once the timer finishes, open the lid and spoon a little onto the cold saucer to see if it sets or runs around. This is a good opportunity to taste test as well. For my last batch I needed to put it back on to cook for a further 10 minutes until it was at a setting stage. This gives you extra time to steam some more jars. Once it is setting on the cold saucer decant the jam into your sterilised, warm jars. I find doing this over a tea towel helps with cleanup. Just a note – if you find the jam is too chunky, resist the urge to blend it after cooking. This will cloud your jam. It will still taste the same, just won’t look as nice. I speak from experience. Now, just to see who the cloudy jam will go to. Might be a good test to see which members of my family read my blog.